Sorry for another delay, folks! Lots of stuff happening so I had to divide my time accordingly. With Europe restarting this month, most attention will be shifted away from MLS. However, expect strong attendance to continue in the Pacific Northwest and new strongholds in the east (Philly, KC). Some of the other locations might take a hit from NFL and college football as fall sports begin play. For the current attendance analysis we have Columbus and New England constantly struggling to fill the stands. Toronto and DCU's poor form is also reflected on their attendance. 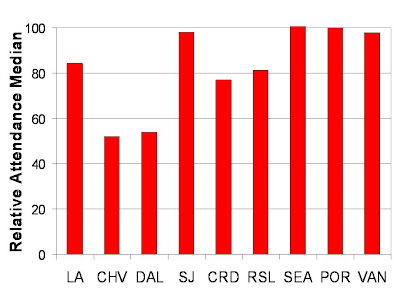 Conversely, Colorado and Dallas continue to make gains relative to 2010 and surely owe their success to their MLS Cup final last season. I wanted to look at medians again but this time for the west and for the relative attendance. 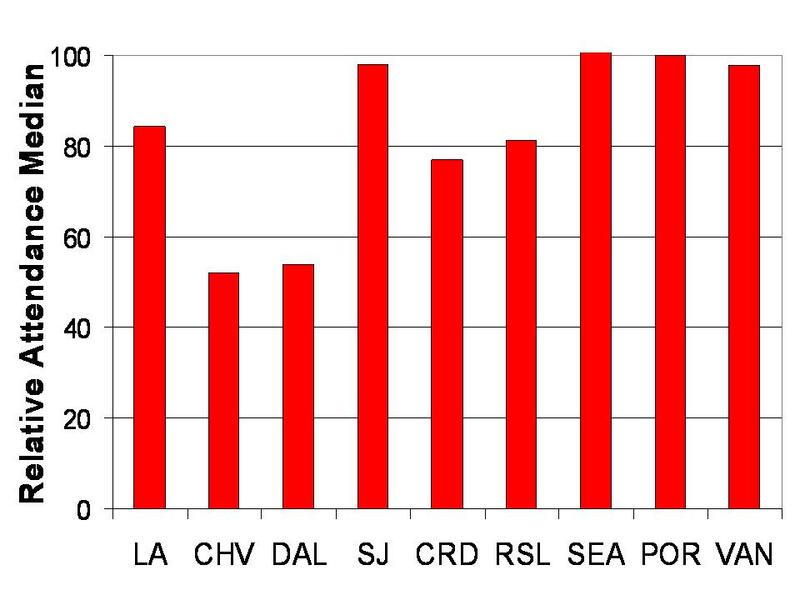 The plot above shows that most teams see over 80% in stadium capacity for most games except for Dallas (64%) and Chivas (54%). Note, however, that Dallas has made a gain of over 2000 seats since last year. Timmy Chandler: Friend or foe?